In this interview, Ashish Shah talks about the company’s strategic vision and growth in providing state-of-the-art services. He speaks about how he is working to keeping the company stable and setting it on the path to profitability and success. For him, the utmost reward is the daily thrill of working with a team that shares the same core values. He escalates all the strategies for Vertoz with his profound technical knowledge of the web services industry, keen eye for business, and an avid desire for growth. In this article, he covers points like how Vertoz is incessantly discovering and retaining various new tools, technologies, and data points to automate buying and selling of digital media. 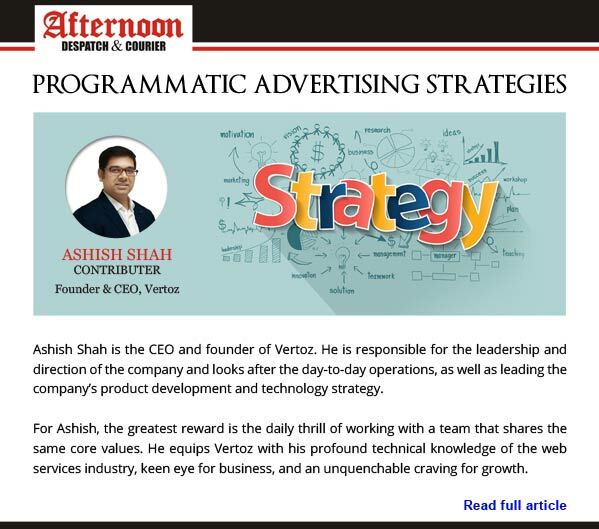 This, in turn, will enable Vertoz to be among the key players in the programmatic advertising space. The Afternoon DC is a legacy that has been transforming and improving the Mumbai city for over 31 years. We offer you non-sensational, factual news and information you need to live the best Mumbai life. Afternoon DC brings the Latest & Daily News on Mumbai and in India. Vertoz is a programmatic advertising company hooked on building a better technology for easy buying and selling of media. We plan on scaling up by tracing more demand and supply partners, onboarding new advertisers, and publishers and upselling and cross-selling of various ad channels or ad formats. All new interactive ad formats for display, video, mobile and native advertising for our customers to connect better with their audiences. Our ingenious platform, proprietary technology and advanced capabilities empower a global roster of top advertisers and publishers all under one roof.